ROAD TOWN, Tortola, VI- The Judicial & Legal Services Commission has appointed Mr. Gerard Farara QC to act as High Court Judge for the Commercial Division of the Eastern Caribbean Supreme Court from November 1, 2015 to January 31, 2016. He will be assigned to the Territory of the Virgin Islands. He will assist in the Commercial Division. Mr. Farara QC is a lawyer with 38 years’ experience and the second native Virgin Islander to practice law in the Territory. He was called to the Bar as a Barrister of Law in 1977 and elevated to the rank of Queen’s Counsel in 1996. His experience includes serving as Crown Counsel in the Attorney General’s Chambers from 1977 to 1978, and as an Associate Lawyer at the Chambers of J.S. Archibald and Co from 1978-1985. He is and has been from its inception the Senior Partner and Head of Litigation at FARARA KERINS, a firm that evolved from FARARA & CO which he founded 30 years ago. FARARA KERINS is a leading civil, corporate and commercial litigation firm providing a range of legal services to local and international clientele including major banks and financial institutions. As a Queen’s Counsel, he has provided expert evidence before courts in foreign jurisdictions including the United States and Hong Kong on a range of BVI legal issues, including corporate and insolvency law. He has extensive practice and experience in multiple areas of law including civil, commercial, corporate and criminal litigation before all courts of the British Virgin Islands and other Caribbean countries. Mr. Farara QC is a specialist practitioner in corporate and insolvency law, and has appeared as lead counsel or co-counsel in many cases before the High Court, the Court of Appeal of the Eastern Caribbean Supreme Court, and the Privy Council in England. 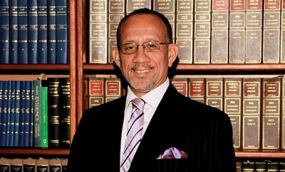 His judicial experience includes serving as Justice (High Court Judge) of the Eastern Caribbean Supreme Court (acting appointments), assigned to St. Lucia in 1997 and Grenada in 2001. He has also served as Justice of Appeal (acting) of the Eastern Caribbean Supreme Court in 2012, 2013 and 2014. Mr. Farara QC has served as Chairman of several statutory bodies and commissions including the BVI Recreation Trust, the Social Security Board Appeals Tribunal from November 1998 to January 2008, the Constitutional Review Commission 2005, and the Ad hoc Committee to Review the Immigration and Passport Act 1977. Mr. Farara QC has also served as Member of several other bodies including the BVI Constitutional Negotiating Team 2006-2007, the Governor’s Committee and Chief Justice’s Focus Committee to look into the feasibility of establishing a Commercial Court in the Virgin Islands, the Interviewing Committee for persons short-listed for appointment as first Judge of the Commercial Court in the Virgin Islands, and the Committee to draft rules for the new Commercial Court Division of the High Court. The Commercial Division of the High Court is recognised as a world-class Commercial Court located in the British Virgin Islands. The court is applicable to six sovereign states and three United Kingdom Overseas Territories which comprise the judicial jurisdiction of the Organisation of the Eastern Caribbean States. You think that job can pay him what he makes on one case? He is just giving back service to the country, but this position certainly builds his resume. He learned from the best in his day -- J.S. Archibald, Q.C. May his soul rest in peace. Gerry is a solid honorable man. Kudos ! !